In April of 1939, the New York World Fair opened to rave reviews and futuristic expectations for progress and humanity. The Fair promoted its message of hope and prosperity with icons, symbols, exhibitions, and demonstrations. The primary stylistic approach was the art deco and streamlined Modern design. In September of 1939, Germany invaded Poland which was the final trigger for World War ll, an event that changed the present and future.. The 1939-40 New York World's Fair was considered a major cultural event even before the first truckload of steel was delivered to Flushing Meadows. The tour begins with the Trylon and Perisphere, as it did for the overwhelming majority of actual visitors. The Trylon and Perisphere were designed by the architectural firm of Harrison & Foulihoux and reflected the emphasis on purity embodied by industrial designers of the day. Ostensibly perfect forms, they were the only structures in the fair permitted to be painted pure white. Public television broadcasting began in the New York City area on the same day as the Fair, a publicity event of such tremendous import that its consequences could not be forseen. Although the first television sets cost several hundred dollars, RCA had transgressed the boundaries of imagination by bringing moving living images into the home. The RCA exhibit, indeed, was the world of tomorrow. The 700-foot round Trylon and 200-foot high Perisphere were connected by a giant ramp called the Helicline, which led visitors back to the grounds once they had visited the structures. At that time the Trylon was the world’s largest escalator. From the Trylon visitors were directed into the Perisphere in order to view "a planned urban and exurban complex of the future," a diorama which filled the floor of the building, entitled Democracity. 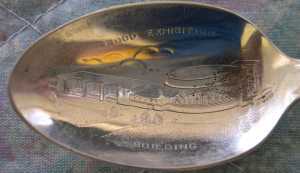 Hand made Art Deco handled sterling spoons by Tiffany & Co. for the 1939 New York World's Fair. The handle is shaped like a long thin 3-sided obelisk (trylon) which was a symbol for the fair. The bowl front is plain and round (Perisphere) and the two objects represented the fair to the world. 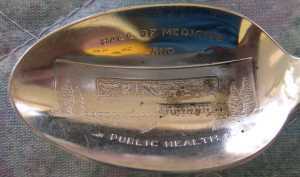 The enlargement shows the bowl reverse. I suspect that this spoon was of very limited production. Note: this spoon was produced in a large and small version. Both are rare. 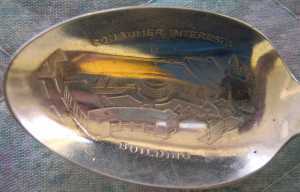 Silver plated ladle with a picture of George Washington at the top. 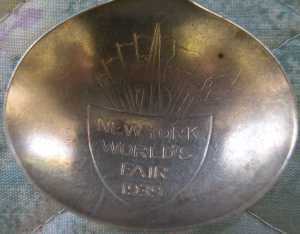 The bowl is marked "New York World's Fair 1939" with a picture of the Trylon and Perisphere surrounded by flags. 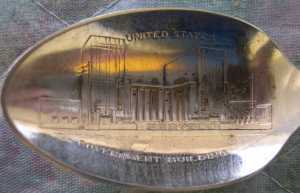 Copyrighted NYWF National Silver Co. 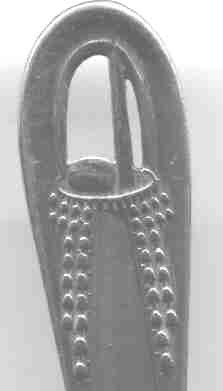 This series of silverplated spoons are usually the only ones from this world fair which are encountered. 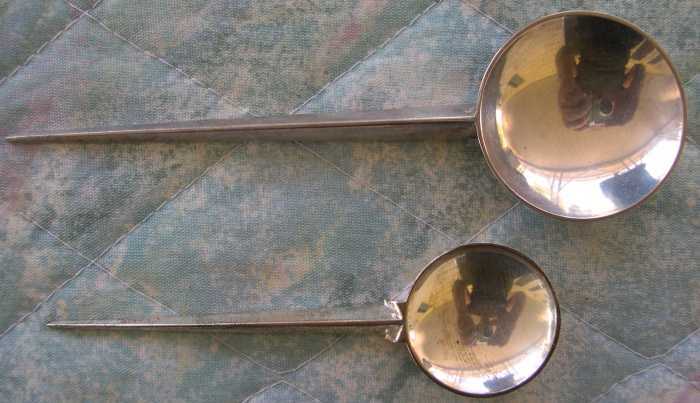 These spoons are neither particularly rare nor valuable. 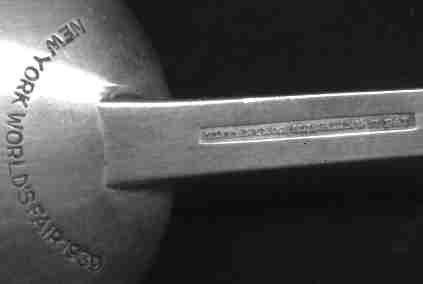 Although they were made by a well known manufacturer (Wm Roger Bros--International Silver), the die casting in the bowl is rather weak, and the designs are hard to see. The stem on all the spoons is the same. 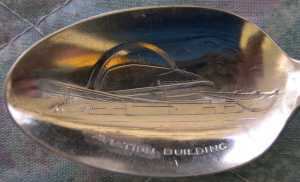 It is made in a nice art deco style which was very popular at this time in history. Note the Trylon and 200-foot high Perisphere which were the major symbols of the fair. The commercial and industrial buildings were the largest and the greatest in number and they covered most of the fair’s grounds. These buildings took much maintenance and office cleaning to keep them immaculate. These structures surrounded the Theme Center and rested on streets with names such as the Court of Communications, the Avenue of Patriots, the Avenue of Pioneers, the Avenue of Labor, and the Court of Power. The fair’s planners and designers intended to include a massive amount of practical and ideological information in the fair, and made it clear that the future of American cities was dependent upon the support of business and technological enterprise. The fair was very prescient in their choices for these exhibits and the General Motors building presented a complex very similar to our modern freeway systems. Visitors viewed the exhibit from moving chairs with individual loudspeakers, taking in what was supposed to be 3000 square miles of American progress and prosperity, the virtual wonderland of the future. The exhibit made a lasting impression upon Walt Disney and similar concepts were used in his theme park, Disneyland. Travel by air, sea, and rail also made their statements about the scale and mobility of the future. Consumer Building--Note the nice horseshoe entry way. This exhibit was similar to a science fair located in a shopping mall. However, when placed in the context of the Depression era their juxtaposition becomes a bit clearer. The buildings of the United States Steel Corporation, and the Consolidated Edison Company demonstrated the "better living through science" mentality as well as General Electric or Westinghouse. The buildings which represented consumption were located in what was called, the "Food Zone". While the buildings representing food and drink products were dotted throughout the fair, most of them were located on either side of Constitution Mall and interspersed with the buildings of production and distribution. The Food Zone unified the visitor with the product by displaying the production of goods as an exhibit or spectacle. For the World's Fair to be truly successful it had to be a conspicuous international event, and the nations of the world were represented in the Government Zone or the "foreign section". The Government Zone was located at the north end of the fairgrounds, with the United States Federal Building capping the axis created by the Chrysler Motors building, the Theme Center, Constitution Mall, the Lagoon of Nations, and the Court of Peace. This was the world's largest diorama and stretched the length of a city block. It was a completely lighted, colored, and animated version of the New York metropolitan area. Although the visitors could not purchase an independent unit of electricity, the product promotion was clear. These were the buildings which lit up the fair and provided the power for Futurama, the new air-conditioning, and a host of other products and events. This was the land of research and development, the point of entry into the world of tomorrow. The fair's Public Health Building displayed advancements in healing and medicine and included a machine designed to keep an isolated chicken heart beating. 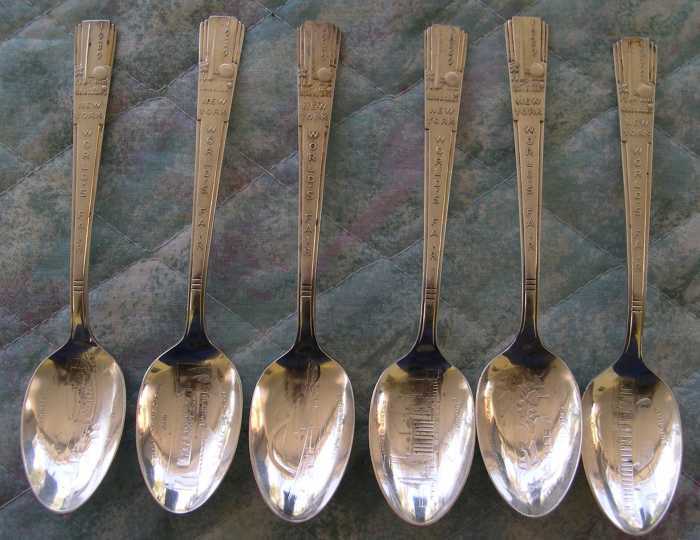 Pam Wright wrote to tell me that there are actually twelve spoons in this series. 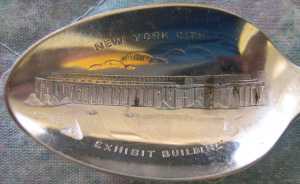 She identifies them as the New York City exhibit building, Consumer Interests Building, United States Goverment Building, Marine Transportation Building, Food Exhibition Building, Aviation Building, Railroad Transportation Building, Georgian Station Section in Court of the State Building, Hall of Medicine, Public Health Building, Administration Building, New York State Amphitheater Building and Textile Building. It has been said that a visitor to the fair could attend every day for two weeks and only skim the surface of most of the exhibits.